Denton ISD students who lived along U.S. 380 used to travel miles to attend Denton High School or Ryan High School. But the rapid growth of the area along the 380 corridor made a new high school critical. 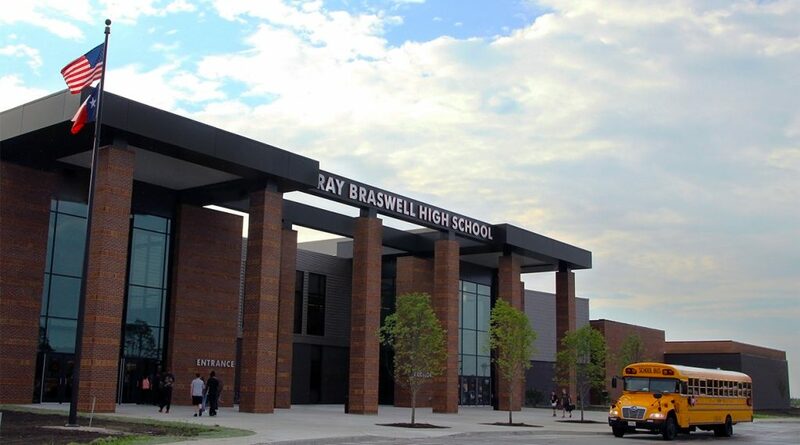 In fact, the district expects Braswell High School to one day serve between 2,400-3,000 students. Students living in ArrowBrooke can now travel to school in about 6-8 minutes. Braswell High School offers 23 AP courses, which encourage students to explore a diverse number of subjects and potentially earn college credits. The school was designed to enhance education through large classrooms, dedicated student/teacher conference spaces with technology integration and outdoor learning spaces for meeting and collaboration. The district also touts a “Bring Your Own Device” policy, which allows students to use mobile devices, tablets and laptops in the classroom. Braswell also offers a unique set of courses to prepare students for a future career or college education. Braswell students can earn certifications and take courses in Law/Criminal Justice, Computers, Computer Networking, Electronics, Advertising Design, Cosmetology, Medical/Health Care, Construction or Architecture, Business, Hospitality, Education, Auto Technology, CNC Manufacturing and Global Information Systems. These courses are taught at Denton ISD’s Advanced Technology Complex. Denton ISD is one of only 10 percent of school districts nationwide that offer orchestra at the elementary, middle and high school level. In fact, the district has been named one of the “Best Communities for Music Education in America” by the National Association of Music Merchants Foundation. Orchestra and band students also get the opportunity to play with the nationally recognized bands of the University of North Texas. For other students interested in the arts, Braswell offers an innovative art room complete with a 3D printer. Theater students have access to a black box theater space and an auditorium for rehearsals and large-scale productions. Despite only being open for a year, Braswell High School students are incredibly proud of their school! The students are creating new traditions as Braswell Bengals that will last for generations to come. The students voted to make the Bengal tiger their mascot last year; and the school’s colors are red and black. The high school is named after a former longtime Denton ISD superintendent, Dr. Ray Braswell. ArrowBrooke is proud to be part of Denton ISD! Students attending Braswell High School will be a short commute away from home, which makes our youngest residents feel even more connected to their community. For more information about the new homes available in ArrowBrooke, visit our website.